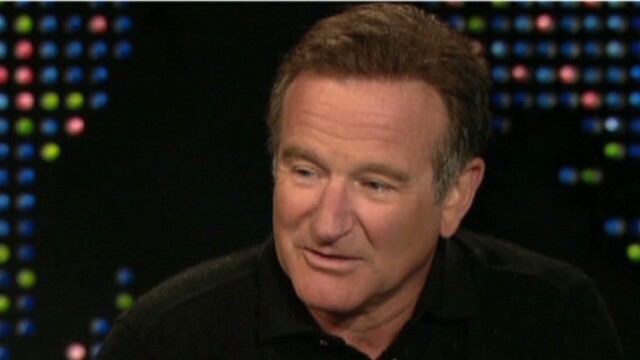 Authorities release new details of the death of comedian Robin Williams. Police reveal details of Robin Williams' death. The U.S. sends more troops to Iraq. And a Missouri town remains on edge after a teen is shot and killed by police. Saying goodbye: The tributes to Robin Williams flow from around the world as stunned friends and family search for answers about why the comic legend would take his own life. Investigators believe Williams, 63, used a belt to hang himself from a bedroom door at his home in California, according to Marin County Assistant Deputy Chief Coroner Lt. Keith Boyd. The coroner's investigation "revealed he had been seeking treatment for depression," Boyd told reporters. Another legend lost: Actress Lauren Bacall, the husky-voiced Hollywood icon known for her sultry sensuality, died yesterday. She was 89. Bacall met future husband Humphrey Bogart in 1944 while filming "To Have and Have Not." They had two children together. She also married actor Jason Robards. Bacall won two Tony Awards and an honorary Oscar; she was nominated for three Emmy Awards. Upping the ante: The United States is sending more troops to northern Iraq, a move that U.S. officials told CNN is necessary to help in the rescue of tens of thousands of Yazidis trapped in the mountains by extremists who have vowed to kill them. About 130 Marines and special operations forces have been dispatched to Irbil, U.S. Secretary of Defense Chuck Hagel said, adding to the hundreds already in the country advising Iraqi troops in their fight against the Islamic State, formerly known as the Islamic State in Iraq and Syria. Unsettled: Police know who shot Michael Brown, but three days after the 18-year-old's death, they're still not saying. Releasing the name of the officer who shot and killed the African-American teen in Ferguson, Missouri, isn't as important, they say, as protecting the community and the person who pulled the trigger. Lawyers representing Brown's family blasted the decision, suggesting authorities were protecting one of their own rather than following standard procedures. A witness told CNN the officer who shot the teen is white. Tensions are high in the community after the weekend shooting. The ball bounces: Former Microsoft CEO Steve Ballmer became the new owner of the NBA's Los Angeles Clippers yesterday. The sale marks the end of Donald Sterling's involvement with the team. The league gave him the boot after he made racist comments to a friend. Sterling bought the Clippers in 1981 for about $12 million and was the longest-tenured owner in the NBA. The negotiated $2 billion sale price is a record for any professional sports franchise in North America. - Musical pacifier: This baby needs a dose of 2 Chainz to make things right. - Feline feat: Mulder the cat has this door-opening thing down to a science. - Sucka QBs: When it comes to their rapping skills, the Mannings should stick to the gridiron. Still, it's fun. - Doggy revival: This pooch will warm your heart as he pushes water toward fish left high 'n' dry. - Playtime: A dog looks on in envy as a fox pounces on his toy. In other news, the National Debt went up $3 Billion dollars yesterday, like it does everyday, if anyone cares?? anyone? anyone? RIP Lauren Bacall. Enyoyed her movies and I loved her voice. OMG!!!!!!!! LOL!!!!!!!! Ely and Peyton most definitely stick to football!!!!!!!! Mulder the cat is so inquisitive, determined and intelligent. Animals are amazing to watch.